Travel around the world on 7 Great Wonders of the World Slots! This 5 reels game is filled with awesome features such as Expanding Wilds and Free Spins! 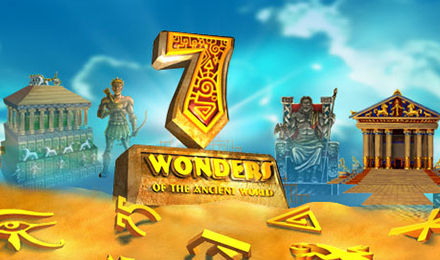 Explore great sights on the exciting 7 Great Wonders of the World online slot to earn huge prizes! Here you will find various popular monuments and places on the reels such as the Great Pyramids and the Sydney Opera House. The video slot has 5 reels and 25 paylines, and it comes with some truly amazing features such as Expanding Wilds, and Free Spins. Wild symbol in a winning combination will expand to cover the entire reel. The World Tour Ticket will lead you to the Free Spins feature where you can receive 7x multiplier with the help of the Wild symbol!